Before becoming a Virtual Assistant, I was a writer, editor of several publications, and a part of the (in)courage team. Now, as a Virtual Assistant, I manage the behind-the-scenes or the things that you’d just rather not deal with so that you can focus on what you’re made to do! Since becoming a VA, I have worked with dozens of clients including Holley Gerth, DaySpring, Kristen Strong, Kayla Aimee, Jennifer Dukes Lee, Susie Larson, Mary Carver, Kat Lee (and many more!). I was selected from a large pool of applicants to become (in)courage’s first (in)tern. During my time working for (in)courage, a part of DaySpring, I implemented several new ideas and saw tremendous outcomes. (in)courage’s statistics and sales steadily climbed, largely in part to my key role, commitment and relentless ambition. I was then promoted to the title of Social Media Assistant and Guest Post Coordinator. I was in charge of all correspondence with the (in)courage email account, created and managed the Pinterest page (4,500+ followers) and Instagram account (8,200+ followers), and helped manage the Twitter account (100,000+ followers). When I began in 2012, the Facebook page had 19,000 likes and grew to over 166,000+ likes before I left. As Guest Post Coordinator, I was head over all aspects of guest posts for (in)courage. I was in charge of selecting, editing, scheduling, and publishing, as well as running social media for numerous posts that would be seen by close to 100,000 people. When I left (in)courage during my senior year of college, I began working as a VA for Holley Gerth. Upon graduation, I began working full-time as a Virtual Assistant. Over two years later… with hundreds of blog posts edited and published, thousands of images created, tens of thousands of social media messages posted, and nearly a dozen book launches under my belt… I can truly say that it’s a joy to partner with my clients to handle the behind-the-scenes magic so they can each serve, write, and lead in the ways that they are gifted. Because each plan is tailored to the individual needs of the client, it is difficult to say that my rate is XYZ per hour. Instead, rates are project or package based, dependent on what you need assistance with. If you’re interested in utilizing my virtual assistant services, please fill out the form below. You can click here to open the form in a new window, or simply answer the questions below. Please make sure to hit submit upon finishing! Beautiful. Yes, indeed every story does matter. PEOPLE matter. Simply beautiful. May God’s favor pour down upon you, Kaitlyn. Thank you so much, Susan! I couldn’t agree more – every story matters. Katilyn you are a very gifted young woman. I ask God to Bless you in everything you do. 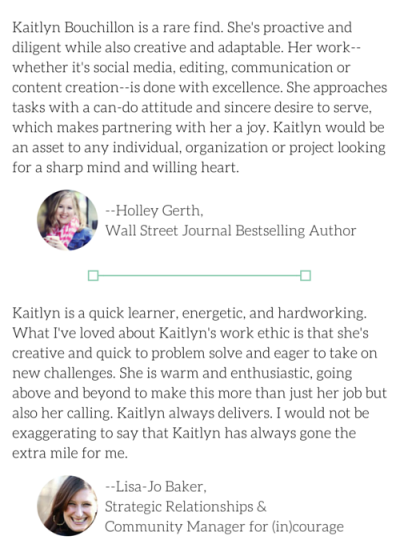 Kaitlyn, You are a breath of fresh air!!! Blessings to you as you seek out your future endeavors…as you so eloquently stated the Lord has your back and you will succeed in all you plan out. I have read Holley’s books and love her expression in the Lord and I am looking forward to reading your’s as well. Enjoy your graduation it’s an event you will always remember ..even when you are my age with 40yrs of marriage and 8 grandbebe’s who call me Nana!!!!! I really appreciate that, Miriam. Thank you! Kaitlyn…Congratulations on your graduation and all your accomplishments….Best wishes as you continue your journey in life!! Thank you – it’s going to be a fun adventure!